My bogging friends if you are looking for a great way to gain followers. Join Terri's Little Haven and all her friends in a Kindle giveaway for this awesome Giveaway Bog Carnival they have put together! Terri's Little Haven, See, Shop, Love!, Ashley And The Little Ones Too and Totally Terri are sponsoring a Kindle for an upcoming Giveaway Blog Carnival. Bloggers can get more likes and follows by signing up to be a part of this giveaway. 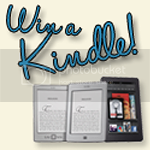 The giveaway will be for a Kindle Touch with special offers and will run from January 3-10. For bloggers to sign up for the first link it is $5.00 made payable to terrishaven@gmail.com as a personal GIFT. Each additional link is $2.00 each. The giveaway will be a big one, there are over 100 bloggers including lots of big name heavy traffic bloggers participating in the blog carnival. December 31 is the last day you can sign up to enter. Terri also has a sponsor (author) who will provide two different eBooks for the winner as well so her books will be included in the giveaway.